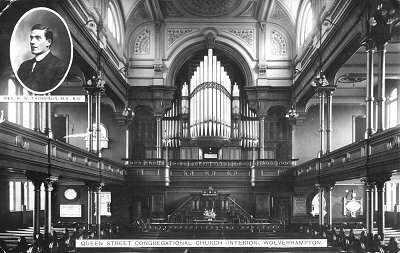 The pictures and information on this page are taken from the book "Queen Street Congregational Church, Wolverhampton: the Story of a Hundred Years 1809-1909" by Henry Arthur May. The book is dated 1909 but no publisher is given - presumably it was published by the church itself. The book contains many other photos, including some of the interiors of these buildings, other churches in other parts of the area and many of ministers. (It also contains much biographical information about Wulfrunians of the Victorian age). I have also used "History of the Congregational Churches of Wolverhampton from the year 1662 to 1894" by Alderman W. H. Jones, published by Alexander and Shepherd, London, 1894. May's book deals mainly with the Queen Street Church; Jones's book deals mainly with the Snow Hill church. 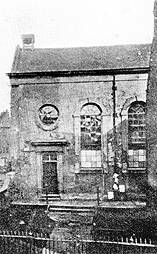 The first building used by nonconformists in Wolverhampton was the John Street Meeting House, St. John's Lane. Built in 1701. This chapel was built to serve all non-conforming people in town and continued in general use until the Socinian split occurred. Then the Unitarians stayed in St. John's Lane and the Trinitarian group seceded, setting up a meeting house in a converted barn in Pounteney's Fold off Dudley Street. 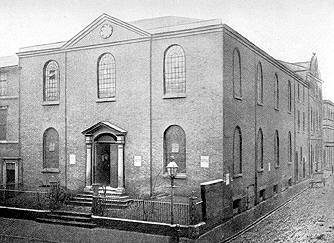 In 1782 they built a new church in Grey Pea Walk (later Temple Street) to which the majority of the congregation moved. 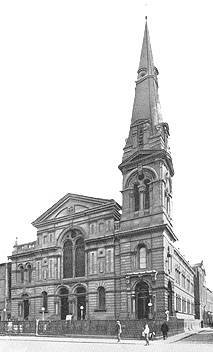 It was that church and congregation which later built and moved into the Congregational Church on Snow Hill. The minority stayed in Pountney's fold until 1800 when they built a new chapel in Princess Street. This church seems to have been very successful and by 1812 the building was too small. 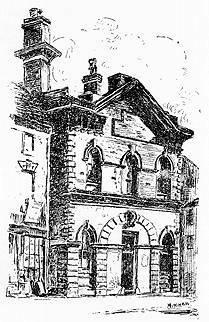 As to the fate of the building and its site, May writes: "The meeting-house in Princess Street, with the exception of the woodwork, which was used up in the new building, was sold to Mr. John Mander for £400 in aid of the new chapel. The Princess Street premises afterwards became the public offices, where the 'town commissioners' and the 'justices of the peace' transacted their business on their removal from Lichfield Street, and before occupying the premises in Garrick Street now used as Technical Schools. Afterwards Messrs. Crowley, Chaplin & Horne used the premises in connection with their business as carriers. In later years the premises were converted into the printing offices of the Chronicle and Express newspapers. Now the site is covered by the premises of Mr. W. Gibbons, printer." Princess Street Congregational Church. Built 1800. Architect unknown. Sketch by A. Bradney Mitchell. "In the summer of 1812 Mr. John Mander secured for them a plot of land at the corner of Queen Street and Market Street. All down Queen Street, on that side, was then garden ground. On the other side were private residences, the largest of these being the residence of Mr. Cooper, a factor, whose warehouses were at the back and fronted Princess Alley. Mr. Cooper's residence is now the office of the Midland Evening News". There are spirits of joy and spirits of woe. In 1862 it was decided that this building was too small. The congregation worshipped in the Corn Exchange while a new church was built. The new church, Queen Street Congregational Church was built in 1864-1866 by Trow & Sons, of Wednesbury. The architect was George Bidlake. The foundation stone was laid on 28th June 1864 by Mr. Thomas Wilkinson Shaw, who then jumped up on it and delivered a lengthy address. 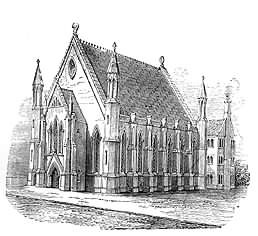 The church was opened for worship on the 9th January 1866. Pevsner says: "Grand, of ashlar, with a corner steeple. Free Italian, but in the long side to Princess Street with its two tiers of triple arched windows remarkably independent". And a footnote reads: "The church has now been pulled down - Wolverhampton's loss". The interior of the church in about 1910, with an inset of the Rev. R. W. Thompson. The Congregational community at Temple Street increased in numbers under the energetic Rev. W H Heudebourck and, at his urging, decided, in 1846, to build a new church. They continued with the project despite the sudden departure of their pastor. The land on Snow Hill was bought from the Duke of Cleveland at £1 per square yard and Edward Banks was appointed as architect. Work on the new chapel, and its associated schools, proceeded throughout the severe depression of 1847. 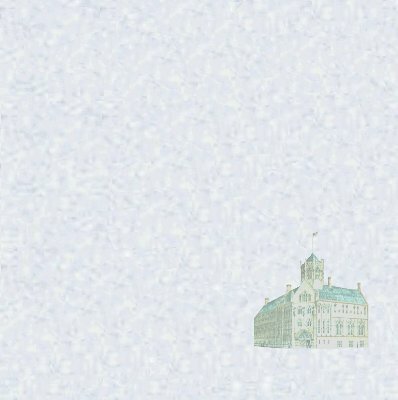 The Schools were completed by July 1848 and duly opened, with a tea-meeting on the first floor. During the proceedings it was noticed that "the floor in the centre was sinking into a kind of dish shape about six inches deep". Everyone fled to the sides and stood there while the floor was propped up from below. Snow Hill Congregational Church built in 1849. Architect, Edward Banks. Then "the people looked at the centre but did not attempt to move. Messrs. John Barker, Adams and Derry took chairs and placed them in the centre space and began to have tea, and tried to look happy, but the people were still afraid". So the pastor got everyone to sing a hymn: "Children, will you go with me/To yon bright world". Perhaps a strange choice but, fortified, no doubt, by the prospect of either getting their tea or making a sudden descent into yon bright world, via the floorboards, people started to move about again. Later the floor was reinforced. (Local confidence in Edward Banks remained high. He built a lot more buildings). The church itself was dedicated on July 31st 1849, a proceeding which passed off without incident.